Hello fells, Good Evening.., Are you want to Linking Pan Card to Aadhar Card ? If yes! 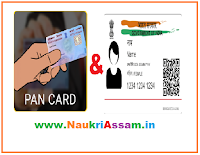 Then you are in the right place; Today In this article, I’m going to share with you very essay method How to Linking Pan Card to Aadhar Card Online & SMS. For more details are provided below..
How to Online Linking PAN with Aadhaar ? The PAN can be linked with the Aadhaar number by sending an SMS to 567678 or 56161 from the registered mobile number. In order to do so, you need to type UIDPAN<12-digit aadhaar=""><10-digit pan=""> and send it.